DB.RTD allows creating refreshable reports and models, for business and trading, based on database data in Microsoft Excel in an easy way. 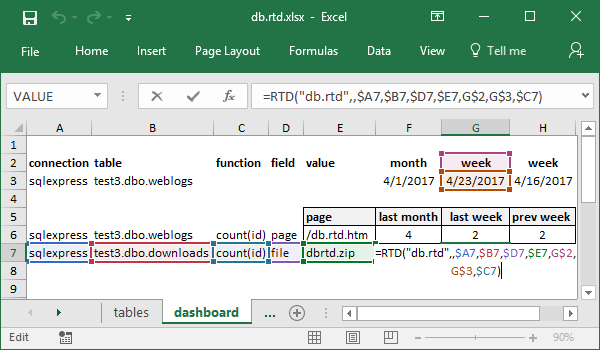 A pivot table for files and weeks from dbo.downloads. So, the target dashboard table will contain four types of formulas. Moreover, if we want to refresh data periodically, we have to record a macro to refresh tables and call the macro on timer events. DB.RTD has a simple and elegant solution. All formulas in the table are regular and have the same structure. So, you may get refreshable data from any database and any table, with any supported aggregate formula like count, max or min. As a result, you may create reports and models with fewer efforts, in less time, and with clear structures. Start learning with the Using DB.RTD topic. DB.RTD requires registration to start a trial. See the Product Registration topic for details.